According to the University of the West Indies (UWI) Seismic Research Centre (SRC) the 5.6 magnitude earthquake occurred at 8:32AM (Local Time) at a depth of 10km. The earthquake was located Latitude 15.11N and Longitude 60.43W at 108 km ESE of Roseau, Dominica. 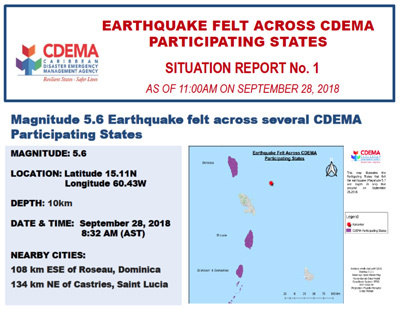 The following CDEMA Participating States reported feeling the earthquake around the same time: Dominica, Saint Lucia, and St. Vincent and the Grenadines. The following is a report from the CARICOM Operational Support Team (COST) that was deployed to Dominica in support of National Emergency Operations Center (NEOC). The NEOC was activated on September 12, 2018 and remain activated with the support of the three (3) members of the COST. Based on the reports from the NEOC in Dominica, minimal damages were reported. The incident is categorised as a Level 1, which means no external assistance is required. 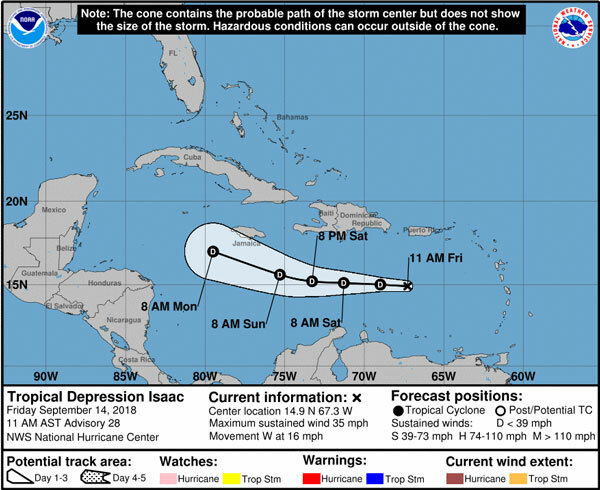 Tropical Wave which generated torrential rainfall and resulted in landslides and flooding in several areas.